We had quite a bit of snow this past few days. Schools were closed and kids were home. Even my husband was home due to the bad weather. When the weather goes bad, and eating out is not an option, I need to come-up with something to feed hungry people in my family. They could easily fix their own ham and cheese sandwich, but returning home with frozen body after playing hard in the snow outside, I feel like I better feed them something more soothing and satisfying. What a thoughtful mother and wife I am? Ha ha ha! So I made this Chicken and Rice Casserole for lunch. 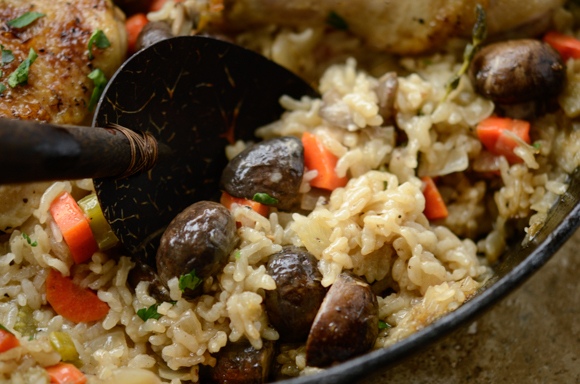 With pieces of boned chicken thighs and drumsticks, mushrooms, onion, carrot, celery, chicken stock, cream and a few sprigs of fresh thyme (or dried), I was able to make a satisfying one dish meal in a skillet. Kids loved it, hubby loved it, and I did too. I have to admit that I sometimes make casseroles with one of those canned soup just because I was too lazy to make from scratch. However making a delicious casserole from scratch is not overly complicated or time consuming. 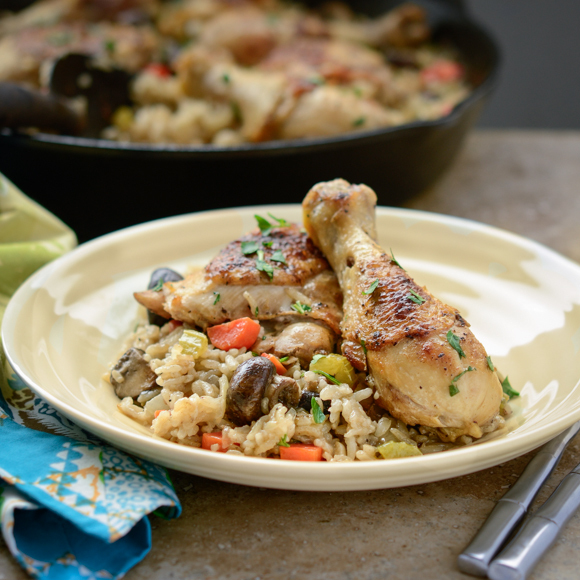 The flavor of this casserole is outstanding; creamy and savory. It can be easily adapted with whatever vegetables you have in your fridge. I bet casserole is most mom’s favorite dish to cook. Because you don’t need to worry about any side dishes to go with and the clean up is a breeze afterward. How sweet? Soak the white rice in water for 20 minutes and drain well. 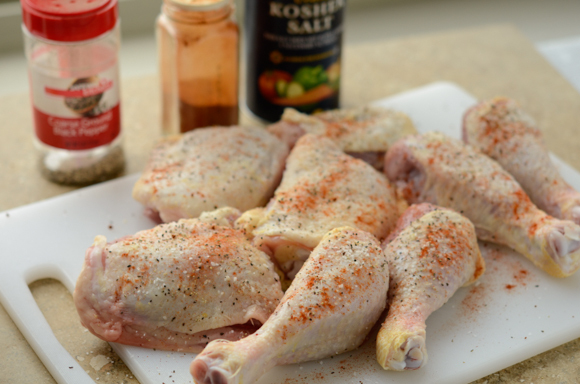 Meanwhile season your chicken with salt, pepper, garlic powder and paprika. 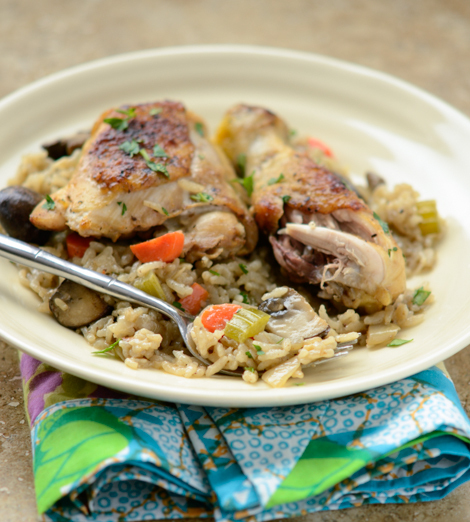 Boned chicken thighs and drumsticks is better option than breasts. Breasts can dry up easily after a long cooking in the oven. Brown the chicken in olive oil, about 4-5 minutes on each side. Transfer to a plate and set aside. 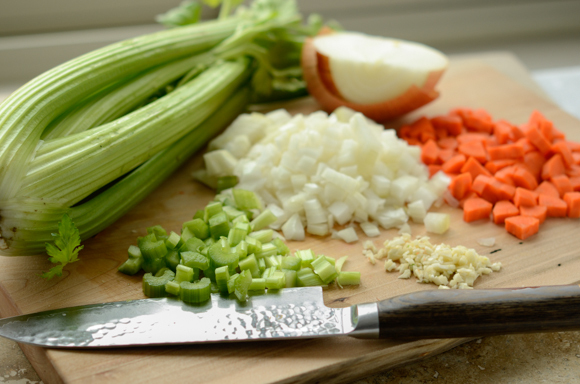 While you are browning the chicken, chop up the holy trinity of vegetables; onion, celery, and carrot. Mince a couple cloves of garlic, and slice mushrooms, too. Set them aside. 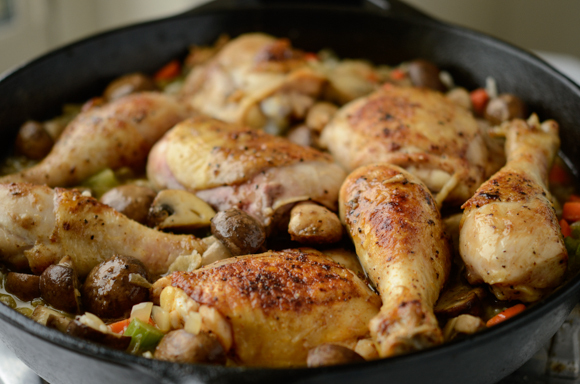 In a same skillet where you browned the chicken, saute mushrooms for 1 minute, add white wine or chicken stock and have it evaporated. 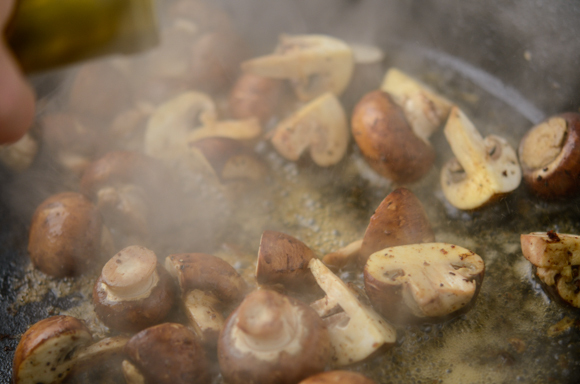 Transfer the mushrooms to another plate. and saute the vegetables and garlic for 3-4 minutes. Add the rice and saute another 2 minutes. and the fresh thyme. You can certainly use dried thyme as well. Return your chicken pieces to top on the mixture. Cover with foil tightly and bake in the preheated 375 degree F oven for 45 minutes. 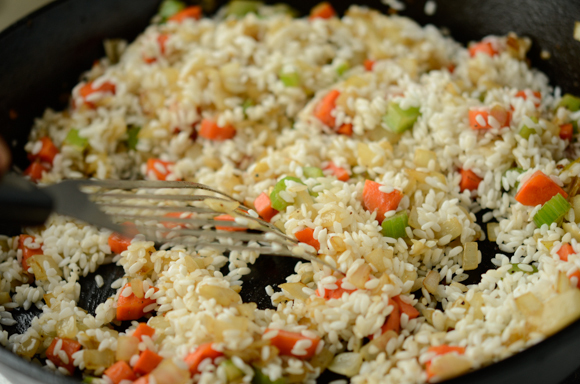 When done, look how creamy the short grain rice looks! 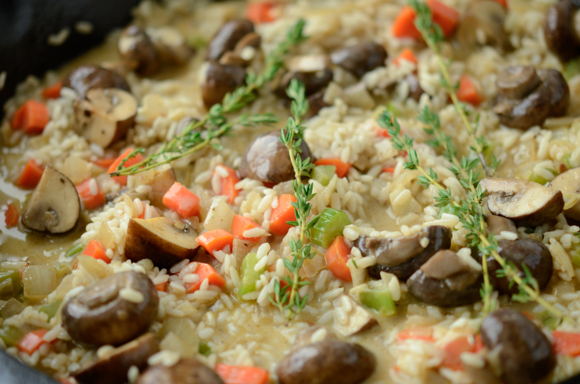 The texture is almost like risotto; very creamy and tender, yet chewy. A satisfying meal made with love.., they better appreciate the cook who made the perfect dish for them. It seems like this winter is lasting longer than I hoped for. Can’t wait for a beautiful spring. 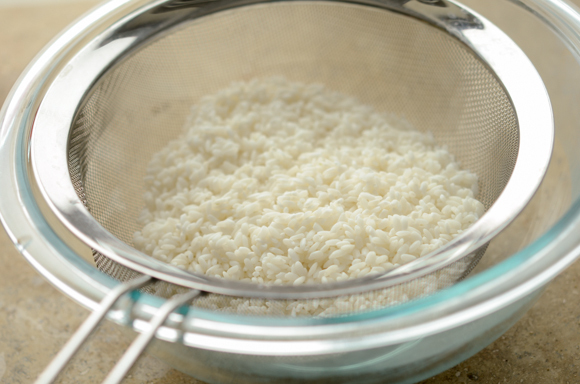 Rinse the rice in water several times and soak in water for 20 minutes, drain and set aside. Season the chicken pieces with salt, pepper, garlic powder, and paprika. 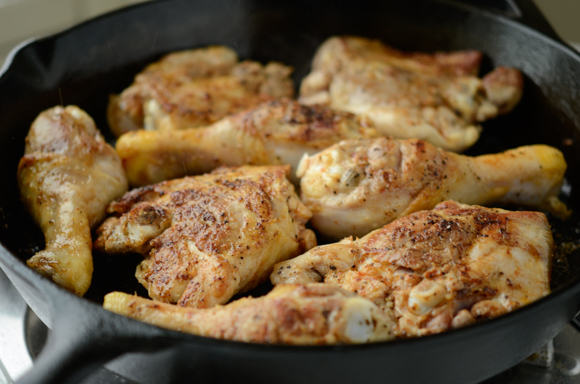 Heat olive oil in a skillet over med-low heat, brown the chicken until golden on both sides, about 5-6 minutes on each side. Transfer to another plate and set aside. 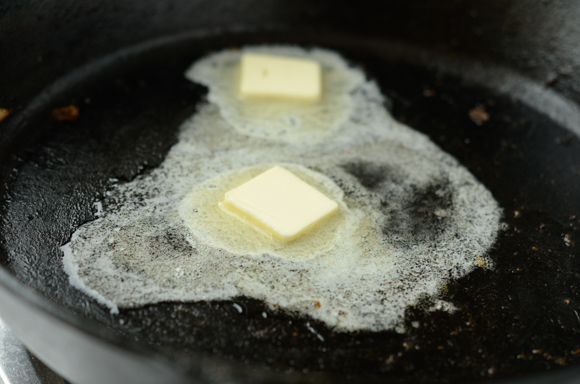 If there is too much grease in a skillet wipe out with a paper towel. 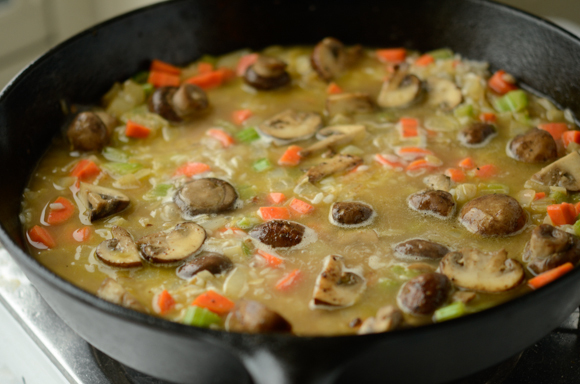 In a same skillet saute the mushrooms for 1 minute and splash with wine (or stock) and let it reduced. Transfer the mushroom to another plate as well. 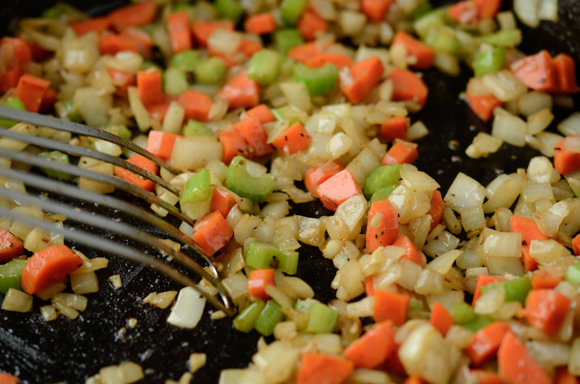 Melt the butter in the skillet and saute the onion, carrot, celery and garlic for 3-4 minutes until slightly soften. Bake the casserole for 45 minutes, and serve hot. As always, a wonderful recipe with beautiful pictures!! This is something I'd make for my husband and myself (it's just the two of us), and would make for leftovers the next day for lunch. Do you think it could be made with brown rice (maybe brown basmati rice)? I'm not supposed to eat white rice anymore. Maybe a bit more cooking time/liquid? The shrooms you used in the pictures are crimini mushrooms, yes? I like those best! Hi Rebecca You can use brown rice. 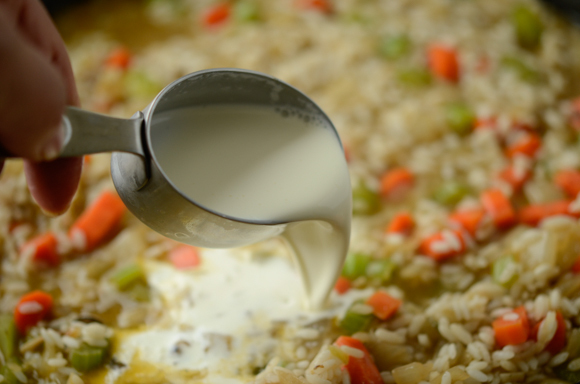 I would soak in water longer, cook with a little more chicken stock, and increase the cooking time. Yes, I used crimini mushrooms. I found they are more flavorful than the white button mushrooms. Oh, and since my oven is not working right now, could it be made completely on the stovetop in a skillet with a tight-fitting lid? Yes. If you have the heavy dutch oven pot, that would be very ideal. What a nice, tasty dish! We've got freezing rain here today, so this would be perfect! Good stuff -- thanks. Um, wow, way to be a horrible person. Wow, what an incredibly rude comment and rude person! 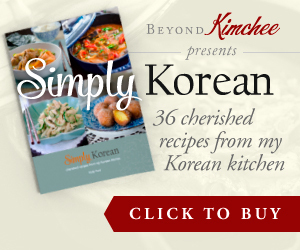 Beyond kimchee is a great blog the way it is because of the variety of recipes that Holly works hard to put on here and cook for her family. If you don't like the recipes, then hop on - this blog is not tailored to your specific requirements. Holly, keep up the good work, your blog is one of the best out there with easy and delicious to follow recipes, great photos and the best part are the stories that you share with us! Holly, This look amazing! I love everything you do on this blog. 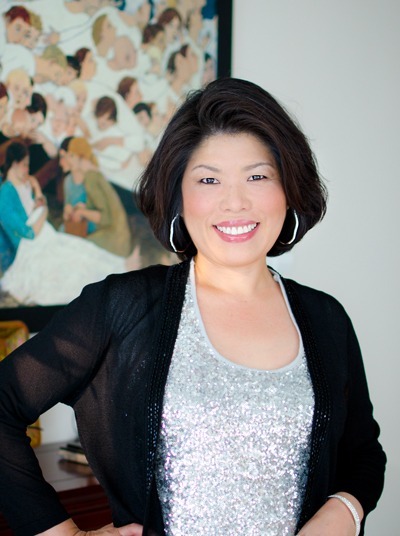 I hope you'll continue to share your lovely stories and your passion for cooking with us! It's finally getting warmer this week(40 degrees feels warm now. Ha!). Perhaps Spring is just around the corner! Thanks Jiji. I appreciate your support. I can't wait for the spring either. This winter has been very long. Wow, this looks amazing!!! Going to make this at the wkend! Holly it's a true comfort food cook for only both of us. Have tried several dishes with rice but not a casserole dish would surely give a try and lovely clicks. As always pretty, pretty photos. If you are not already tempted by the recipe, the photos will tip you over! 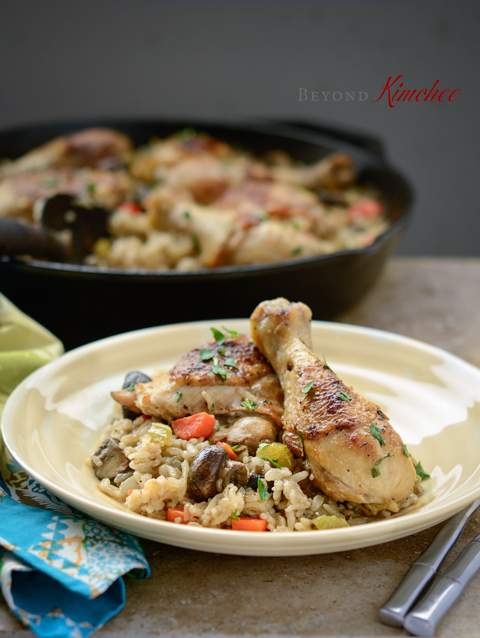 My mouth was watering as I read through this recipe....I immediately pulled some chicken out of the freezer and made this for dinner. Simple ingredients, very rich-tasting and polished result. For the record, I visited your site originally for the Korean recipes but I enjoy the other types of recipes you post too. We are all allowed to explore in our kitchens! I can't believe the condescending comment that other visitor made. Thank you, Tarmar, for your support. You are right. We enjoy ourselves exploring diversity of food in our own kitchen. That's how we learn and expand our horizon. Hi Holly, My husband and I enjoyed this dish. The two of us almost finished the whole pot. I will be trying this with fish fillet next. Thanks. That is great! Let me know how you like with fish in the recipe. Thanks!